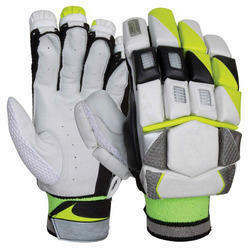 Leading Manufacturer of batting gloves, cricket batting gloves and leather bent cricket batting gloves from Jalandhar. Bestowed with an ingenious team of designers and advanced production unit, we have been able to introduce an exclusive range of Batting Gloves. At our production unit, the professionals hand stitched the gloves using optimum grade materials along with adhering to sports industry standards. The offered gloves is created using leather base materials and by applying latest technology. In addition, quality controllers from our team opt for strict quality inspection made on the gloves to ensure flawless deliveries. 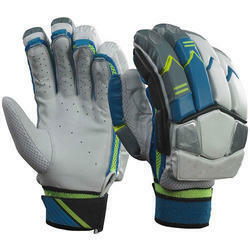 Our organization takes pleasure to introduce its business as one of the leading entity offering Cricket Batting Gloves. These gloves are manufactured using leather materials. Quality-centric fabrication being our main concern; our team ensures that the clients find perfect gloves for a perfect catch. Two layering techniques are applied to offer a robust thickness to the gloves. In addition, we follow the internationally designated standards and smart techniques to develop well balanced and perfect gloves for the players. 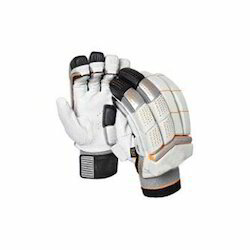 With the excellent support of our brilliant professionals, we are engaged in presenting Leather Bent Cricket Batting Gloves. These gloves are manufactured utilizing leather. Applying such material during fabrication of the offered gloves helps in providing a protective layer against alkaline, lead and various other chemical elements present in air and on ground. In cricket, such quality fabrication has been always appreciated as it supports hard play for long hours. The offered gloves can be made available at industry leading prices to the clients. Looking for Cricket Gloves ?